Ideally placed circuit for those drivers wishing to go karting near Coventry or Rugby. A 2 x 15-minute practice for a group of kids accompanied by an adult or 2 for an exclusive family session. For groups of 10+ drivers: 5 laps of practice for every driver.Every driver then has 5 x 8 lap heats, with the top six drivers contesting a 12 lap final. 10 laps practice and qualifying session then a 35-lap race, fastest starting on pole. The grid is then reformed in reverse order for another 35-lap race. 10 laps practice and qualifying session then a 45-lap race, fastest starting on pole. The grid is then reformed in reverse order for another 45-lap race. 6 laps of practice for every driver.Every driver then has 5 x 8 lap heats, 12-lap semi-finals with the top six drivers contesting a 20-lap final. A 90-minute team endurance event. 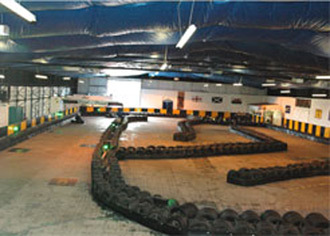 Qualifying to determine your grid position then a non-stop 90-minute relay event for teams of 3 drivers sharing a kart. Junior party for up to eight drivers over the age of 8 years and over 132cm in height. 2 x 15-minute sessions with exclusive use of the circuit. There are conference facilities for 70.